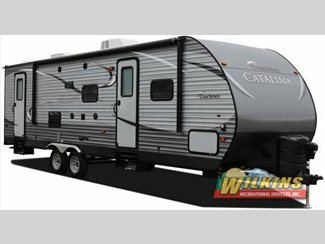 Catalina travel trailers come from one of the most trusted names in the RV industry: Coachmen. These travel trailers offer you an incredible living experience, with many standard features you’d expect to pay more for. Their lightweight design and easy to tow style, make them fuel efficient and perfect for everyone form large families heading to the Grand Canyon for a grand adventure to couples just looking for relaxation at their local state park. One of the best features of the Catalina is the wide variety of floorplans available. Several models feature bunkhouses, which are ideal for large families with children. This ensures the kids have their own separate space to play in, while mom and dad can relax in their own space. Catalina’s spacious kitchens and large dinettes allow you to enjoy a home cooked meal together as a family. The ample counter space and storage in the kitchen means you can bring along everything needed to get creative, without feeling cramped. And, overhead cabinetry offers additional storage space for plates, pots and pans. If you enjoy kicking back and relaxing you’ll love this travel trailer’s plush furnishings that beckon. After a long day put up your feet and turn on your favorite movie. Several floorplans come with both sofas and chairs, so everyone has a place to sit. Even if you’re just looking to hang out in your local state park and enjoy some fresh air, you’ll love how the Catalina RV offers a wide range of models that accommodate everyone from the casual weekend RVer to road warriors. 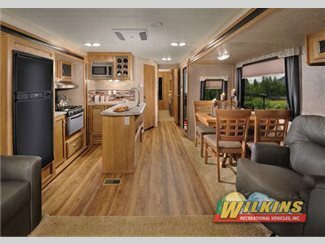 Get in touch with our team here at Wilkins RV to learn how this travel trailer might work for you. We will answer any questions you have and make sure you find the best unit for your needs.